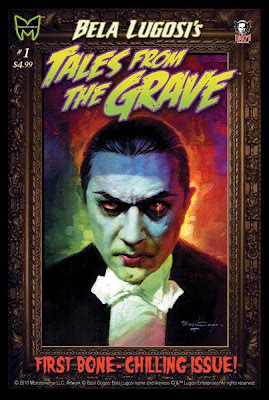 Scary Terry's World: Bela Lugosi's TALES FROM THE GRAVE! I recently finished the artwork for a story that will be included in the first issue of the new comic book, Bela Lugosi's TALES FROM THE GRAVE. The script was written by my friend (and former Tekno-Comix editor), Martin Powell, and was a real treat to draw. Editor/art director Kerry Gammill made some contributions to the art as well, and Tom Smith finished up with a great color job. You can see the final production in the published comic this Fall. In the meantime, here's a peak at Basil Gogos' fantastic cover illustration! "Hey" back at you, Andres!